It’s time to fire up the cauldron and don your witchy chef hat! 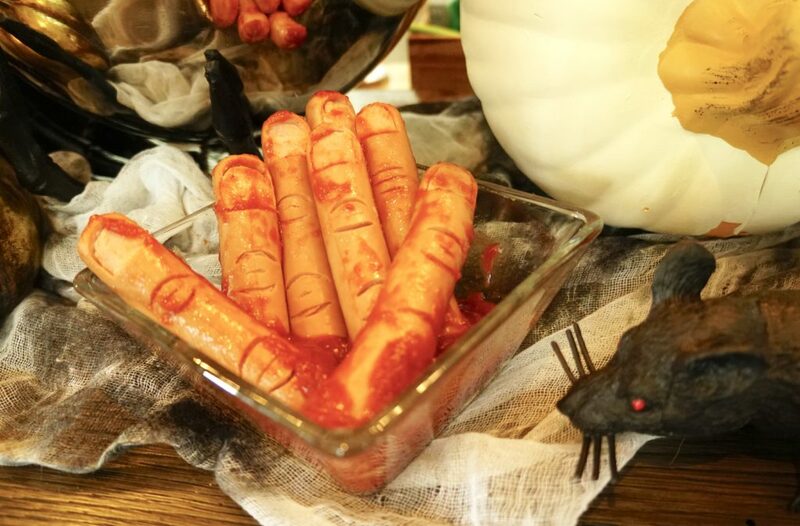 Halloween is the culmination of creativity and creepy, and when it comes to the party food- we’ve got you covered. 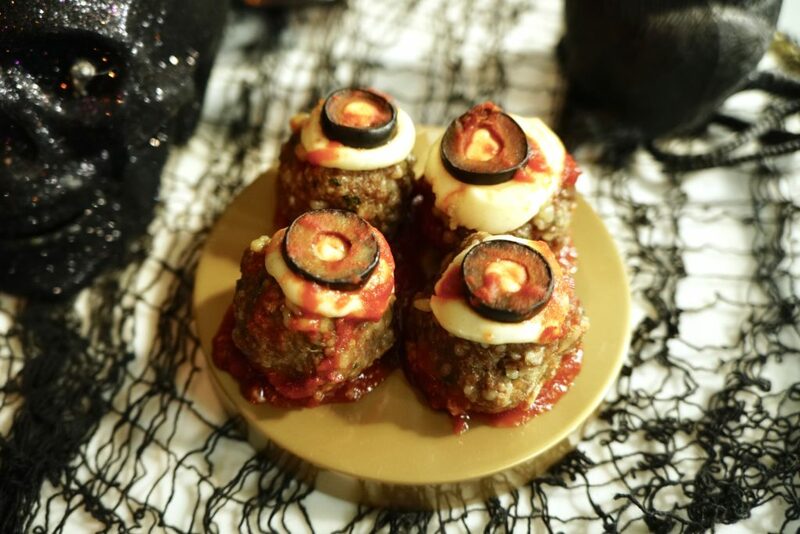 Our tricks and treats will add a layer of gruesome fun to your monster bash! 1. Cut small square for finger nail at the top of the hotdog. 4. Serve coated with low carb ketchup. 1. In a large bowl, whisk together almond flour, Swerve, psyllium husk powder, baking powder, baking soda, salt and xanthan gum. 2. 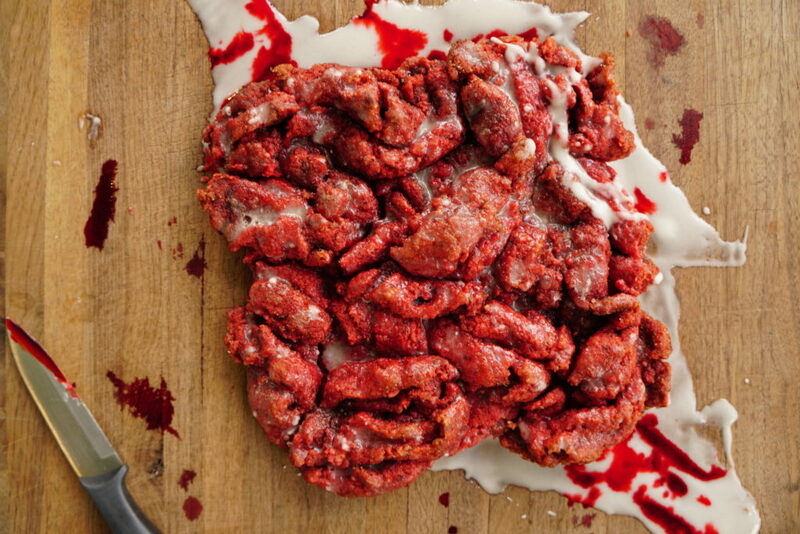 Stir in eggs, butter, and red food coloring until dough forms. 3. Roll out dough into a rectangle between 2 pieces of parchment paper. 4. Refrigerate 20-30 minutes, until dough is firm. 5. Brush dough with melted butter, then sprinkle with brown sugar substitute and cinnamon. For thick guts: Starting at the longer edge of the dough, roll tightly to form one long cinnamon roll. For thin guts: Cut dough length wise into 3-4 sections. Roll each section of dough to form long rolls. 7. Bake at 350 for 15-20 minutes. 8. Remove from oven and let cool 10-15 minutes. 1. Add all ingredients to a large mixing bowl and mix well. 3. Bake at 400F for 20-25 minutes, until thoroughly cooked. 6. Place olive slice in center to look like pupil of eye. 7. Poke toothpick in center of each to hold in place. 8. Return to oven for 1-2 minutes until cheese is soft. 10. Serve with low carb ketchup. How do you celebrate Halloween!? Email us your favorite (and gross) recipes to YUM@pruvithq.com. Make sure to tag us on Instagram when you post your wicked creations on Halloween so we can see!